The theatrical show “Regalia – The Enchanted Forest” debuted on June 4th and will be delighting audiences at the Bali Theater until December 30, 2011. The show lasts about 1.5 hours and features an international cast of acrobats, dancers, singers, and actors. Performances take place every Thursday, Friday and Saturday and doors open at 6:00 pm. Ticket prices start from USD25 per person. “Regalia – The Enchanted Forest” is a Cirque du Soliel-style theatrical extravaganza and the performance tells a romantic story set in the magical forest of Regalia. It is the first show of this caliber to take place in Bali and is being held at the high-tech Bali Theatre at the Bali Safari and Marine Park. Ticket prices are USD25 for silver-class seating in the wings or USD35 for gold-class tickets with preferred central seating. 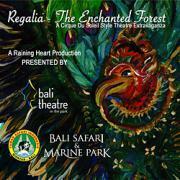 Tickets to “Regalia – The Enchanted Forest” are available by contacting the Bali Safari and Marine Park at (62) 361 950 000 or by booking on their website. Tickets are also available through most Bali hotels and travel agencies.